Come craft with me in person! Yesterday was QUITE a day! I was at Michaels gathering up all kinds of goodies for a very special event. Check out this pile of goodness! I aim to create three projects out of this, so not only can I show you what I did, I can teach those that are near me how to make them too! In person. Care to attempt to guess what I’m up to? That is a stretched burlap frame which houses a hefty wood frame underneath. My little brainstorm is close to something I’ve made in the past. 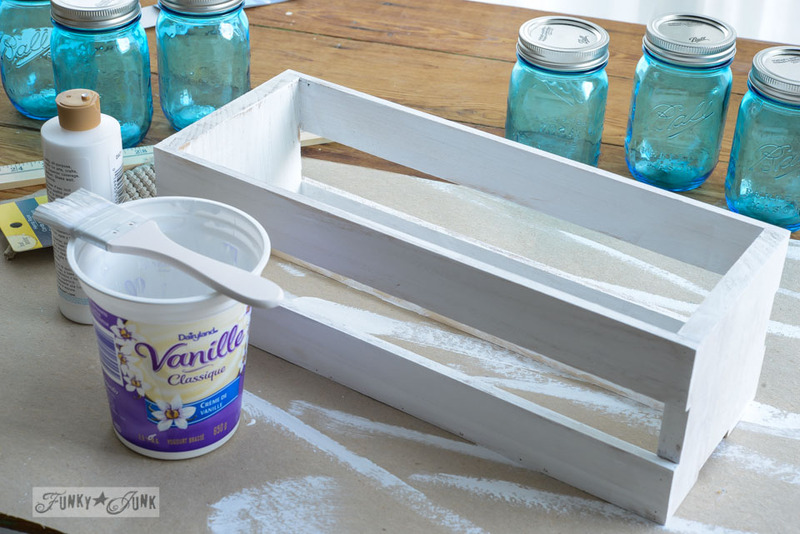 The chunky chalkboard clothespins will serve to do something, along with that pretty twine. And the burlap flowers? They’re just pretty! A stencil may also be incorporated into the look. We’re getting downright earthy with this one. The adorable chalkboard stakes will ultimately label the creations inside the clay pots. I’ll be doing a host of things I’ve never done before. Wish me luck! The mason jars nailed this one. I had to have them! 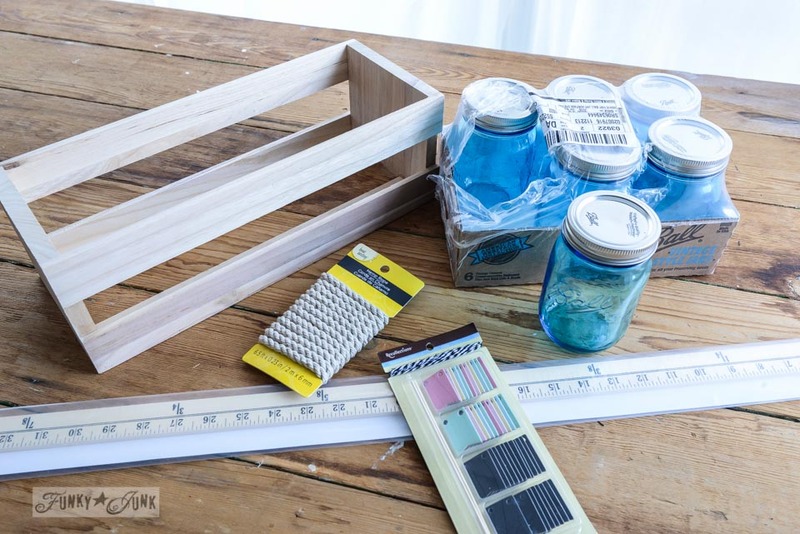 They’ll be teamed up with an adorable mini chalkboard pennant, heavy twine, cute crate, paint and maybe even that yardstick. And more. Drop. Dead. NEED. 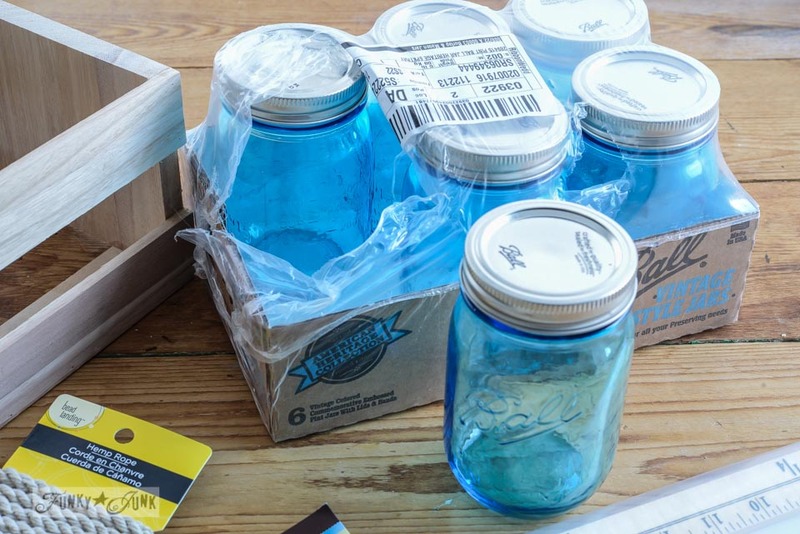 These vintage coloured Ball mason jars are to DIE for. They came in clear too. In different sizes. And also jam jars. Goodness… I need to go back. So what’s going on you ask? Something big. VERY VERY BIG. There’s gonna be a BIG party on Feb 16, between 1-4pm. 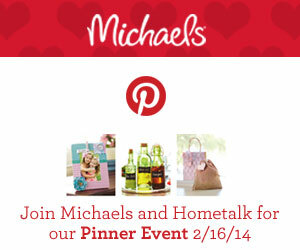 Join Hometalk and Michaels and one of 100 bloggers near you for a Pinterest party! That’s right. 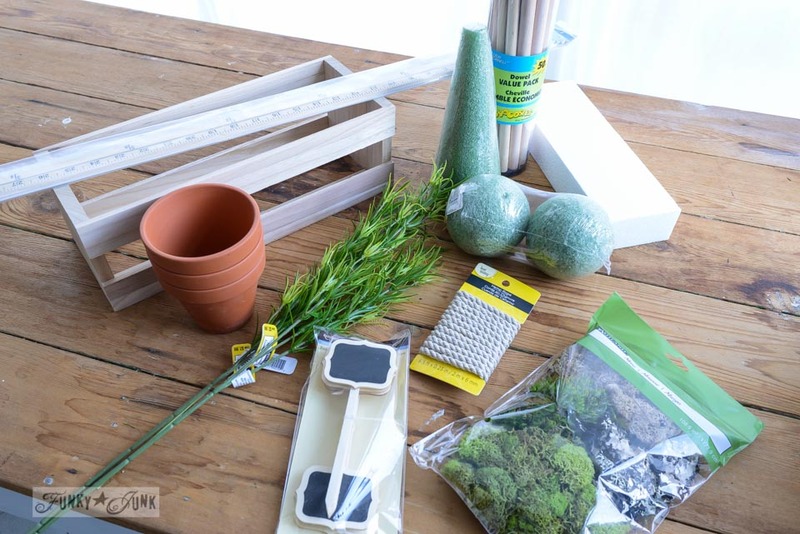 100 stores will host a party with a blogger in attendance, helping you get your craft on. 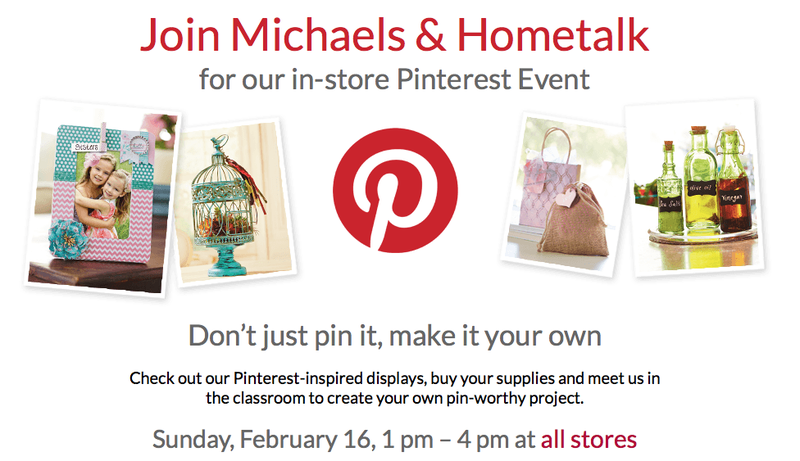 Check out the Pinterest inspired displays at your local Michaels store, buy your supplies, and meet us in the classroom to create your own pin-worthy project! Visit the complete store listings HERE to see if your Michaels is included, and which blog will be hosting! 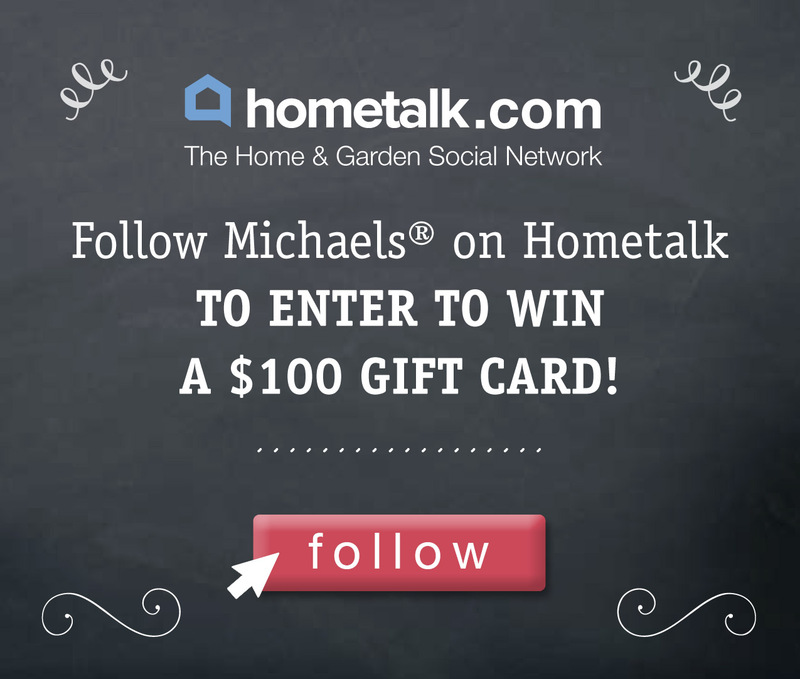 Follow Michael’s on Hometalk to enter to win a $100 Michaels gift card! Five winners (wow!) will be announced on Hometalk’s FB page on Feb 17, after the party. 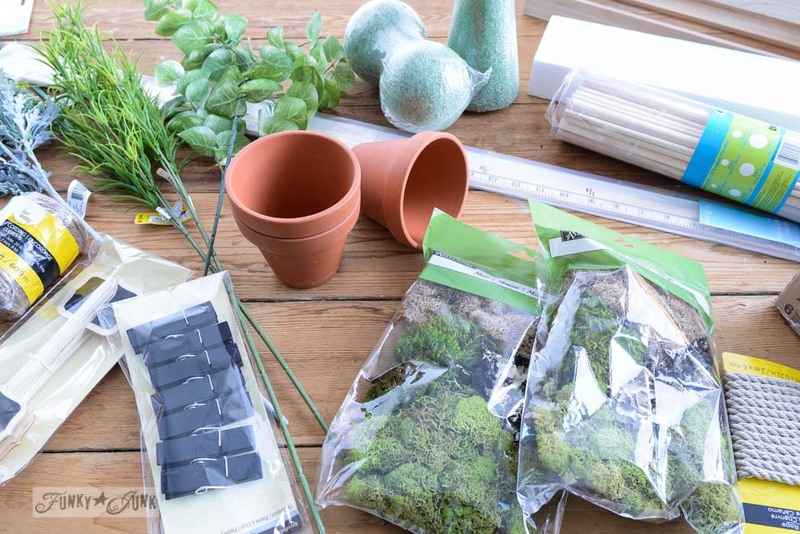 If you don’t already know, Hometalk is a home and garden social network where you can share your projects, as well as learn from professionals, for free! You can visit my profile HERE to see how it’s all layed out. It’s a super great place to upload your own projects without needing a blog! So anyway, I was in Michaels Abbotsford yesterday for 4 hours… FOUR, shopping for things that spoke to me. I’ll be showing you what I come up with over the next few days right here on the blog, which I’ll take to the event, for those that wish to make them too. But you don’t have to make what I make. 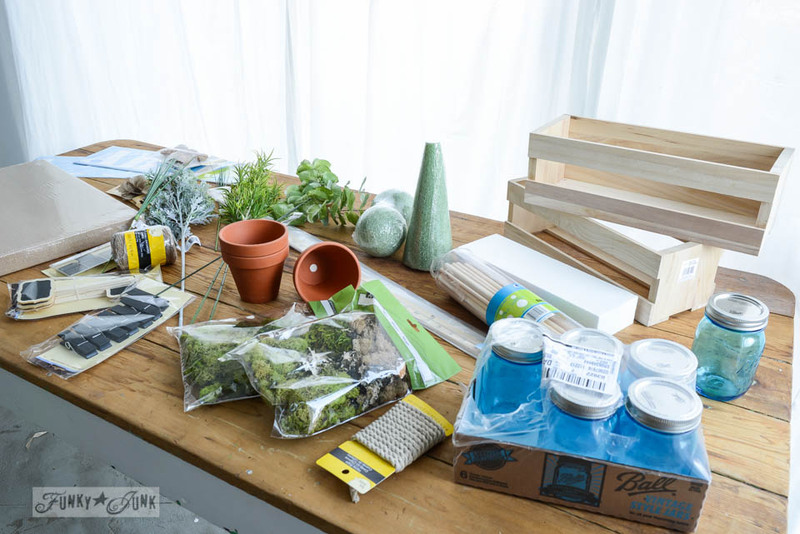 You can apply your own twist to a variety of Pinterest kits or just make whatever YOU wish! Not a crafter? Come visit anyway! Bring your Starbucks for a crafter’s afternoon out. But be prepared to be inspired regardless… there’s a whole lotta cool stuff in these stores! You may think I’m just saying that. But I’m not. It’s one thing to sit behind a computer screen and share, but it isn’t the same as hearing your stories, accomplishments and goals. I LOVE connecting with those that follow this little junk story of mine, because we have something big in common. Passion. And once we meet, we’ll be chatting like life long buddies in seconds. You just wait. So please, pretty please, I hope you will allow me the opportunity to hook up with you for an afternoon making something cool! It will be so fun! When a junker stocks up on new crafts, she makes… well, we’ll have to see what that ends up being after it’s all done. Stay tuned! 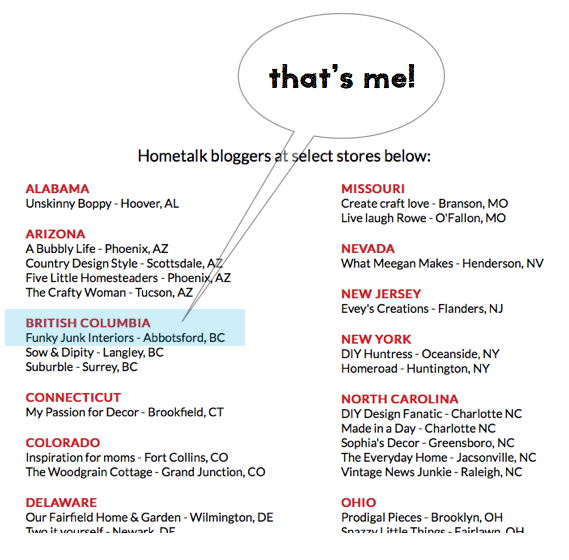 Disclosure / I’ve partnered with Michaels and Hometalk for this event. But my project ideas, opinions, excitement, and nagging selfie calendar are my own. 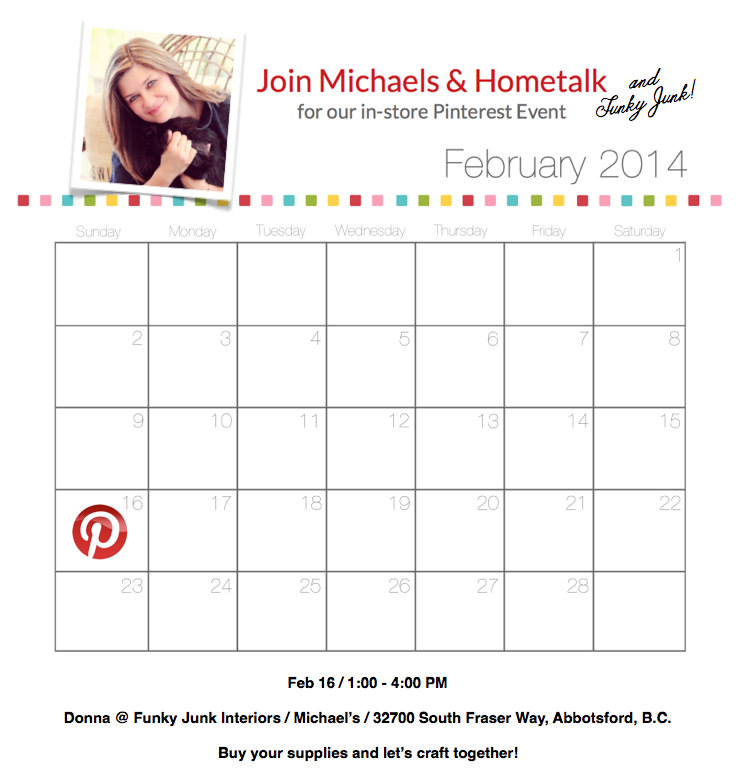 Visit Michaels Abbotsford location online HERE. 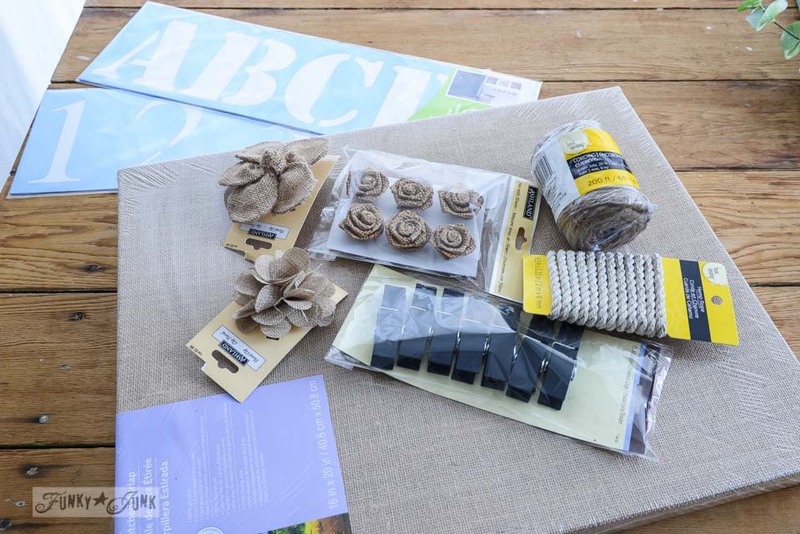 Crafting with 100 bloggers… you should go! Will you be? So wish I was in BC so I could vsit with you at Michaels. Looking forward to your completed craft projects being posted. Looking forward to see your finished projects. I see that our Michaels is not on the list, but how fun it would be. This sounds like fun and so exciting Donna, I would love to make it to one of these but I am spending the weekend with my sisters in Dallas, celebrating sister Sandys, 50th birthday! Niether are into crafting so I probably won’t be able to persuade them into going…:( However, I’ll still enjoy my time with them. Have fun! Can’t wait to see what you create! Boo! My local Michals is not participating! Please encourage them to get in on this! Lubbock, TX Michals…Can’t wait to see what you make! Hi Donna thourghly loved your class.I made the canvas that said CREATE I hope Michaels hosts another one. My daughter and I took her picture she did to her brothers for his baby boy and they loved it. Baby Dominic is only 3days old.His room isn’t quite finished, so Robin his mom will have the safari pic up as soon as she can. Yes it was fun today. My FB page is Sandy’s Handcrafted Gifts.